The family of beverages generally referred to as "beer" has been brewed for centuries. Beers are obtained by the yeast fermentation of malted cereal grains, to which hops and water have been added. Brewing has evolved from a cottage craft into a modern industry where large breweries export their beers worldwide. On a per capita basis, Germans consume the most beer at about 40 gallons (151 1) per person per year. Beer drinkers in the U.S. rank fourteenth in the world, with American breweries producing approximately 156,900 million barrels of beer a year. Each barrel is the equivalent of 117 liters or approximately 31 gallons. The true origin of beer can only be conjectured. Early attempts at brewing occurred around 7000 B.C. in Mesopotamia. The Egyptians and Greeks also brewed alcoholic beverages by various methods, but the term "beer" did not appear in these early languages. The Babylonians offered brewing recipes, and there are various references to beer in the Bible. The English word "beer" seems to stem from the Celtic word "beor," which referred to a malt brew made by monks at a North Gaul monastery. In the Middle Ages, monasteries were the leading producers of beer, and monks are credited with many early brewing techniques, such as the addition of hops to improve the aroma and help preserve the beer. The distinction between ales, lagers, and darker bock beers began to appear in French and Irish writings in the 13th century. It is generally accepted that the modern beers as we know them today date to the 1600s. Beer brewing was already a thriving industry in Europe when the United States declared its independence in 1776. European immigrants brought their brewing skills to America and founded a thriving beer industry. Some technological advancements—the yeast separator, for example—made mass production of beer possible. Bottled beer was introduced in 1875 by the Joseph Schlitz Brewing Company in Milwaukee, Wisconsin, a city famed for its breweries. Canned beer first came on the market in the 1930s. The American beer market today is dominated by several large companies such as Miller and Anheuser Busch, though microbreweries and brew pubs that produce their own brands are becoming increasingly popular. Beer requires these ingredients for brewing: properly prepared cereal grain (usually barley and corn or rice), hops (scientific name Humulus lupulus), pure water, and brewer's yeast. Each ingredient can affect flavor, color, carbonation, alcohol content, and other subtle changes in the beer. Grains are carefully stored and handled to promote highest quality. Hops are a form of cultivated perennial hemp, and the useful portions of the vine, the sticky cones, are developed from the bloom. About 35 pounds (16 kg) of barley malt and 15 pounds (7 kg) of grain are used to make each 31-gallon barrel of beer. Large quantities of pure water are extremely important not only as an ingredient, but for maintaining the cleanliness of the brewing equipment. In beer, water high in lime or iron can interfere with the fermentation process and discolor the final product. Yeasts are fungi, which are microorganisms that reduce sugars to alcohol by fermentation. Some types of brewer's yeast are closely guarded trade secrets. Outside of the beer itself, the process also requires various acids and cleaning chemicals to maintain and sterilize the brewing equipment. The finished product also requires packaging, which includes card-board products for boxes, aluminum for cans, glass for bottles, and stainless steel for kegs and other commercial dispensing equipment. The majority of the brewing equipment is stainless steel, with the exception of the brew kettles, which are copper. 1 Fully ripened barley grains are "steeped," or soaked in cold water until they are fully saturated. The water is changed once a day, and after 45-72 hours the grains are placed in shallow tanks. The grain is aerated and stirred, which causes it to germinate, releasing enzymes such as malt diastase. Malt diastase converts the starches contained in the grain to sugar for fermentation. As soon as the germination is adequately complete, usually six days, the grain is roasted to stop the germination process. The exact point at which the roasting starts and ends affects the flavor and color of the beer. The product at this point is referred to as malt. The automatic canning machinery dwarfs the workers in this 1970s brewery canning room. While amateur brewers swap recipes at will, the commercial recipes for beer are held tightly as any state secret. Until recent decades, the production of beer, like wine, was a wonderful combination of art, science, and luck. At the heart of the process has been the brewmaster, a traditional handcraftsman wrapped in the lab coat of a scientist and carrying the clipboard of a production engineer. In the 20th century, corporate breweries have evolved into an intriguing combination of flow production In the brewing process and automated canning, bottling, and warehousing. In the 19th century, the brewing industry flourished as numerous brewmasters drew on their European heritages and functioned as chemists, biologists, engineers, inventors, and salesmen. The combination of local ingredients, water quality, and the brewmaster's traditions and skill meant that many regions, even locales, could have their own brands. 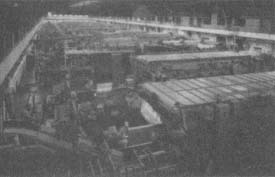 Before mechanical refrigeration, pasteurization, and rapid transportation facilities, national distribution was, of course, impossible. One result of this was that the United States has always enjoyed a wide variety of regional beers. In 1867 there were breweries in every state and territory, an astonishing total of 3,700; in 1934 there were still over 800 in operation; in 1994 there wore about 500. After Prohibition and with the development of steel cans for beer in 1935, breweries shifted their focus away from primary interest in bars and toward home consumption. Despite the seeming pervasiveness of national brands from the mega-breweries supported by their huge advertising budgets, this tradition of hundreds of local brands continues. In recent years it has even been augmented by the proliferation of so-called "microbreweries" which often display the brewing equipment as part of the decor of a drinking establishment and distribute their products primarily on-site. 2 The malt is crushed using iron rollers and transferred to the mash tank (or "tun"). This tank is a large copper or stainless steel vessel that mixes the malt with warm water until it is of porridge-like consistency. This mixture is called mash. 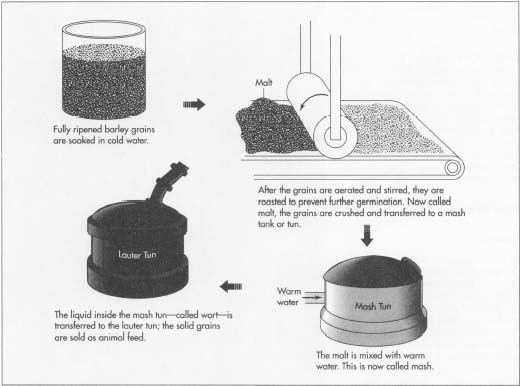 After mixing with similarly prepared cereal grains, the temperature of the mash is raised incrementally from 100-170°F (38-77°C) so that the enzymes react. The enzymes break down the starch in the grain and convert it to simple sugars. Later, the yeast will convert the sugars into alcohol. Once complete, the mash is allowed to sit undisturbed so the solids can descend to the bottom of the tank. Beer requires these ingredients for proper brewing: prepared cereal grain (usually barley and corn or rice), hops, pure water, and brewer's yeast. Each ingredient can affect flavor, color, carbonation, alcohol content, and other subtle changes in the beer. 3 The liquid contained in the mash is transferred into another tank called a lauter tun. This is accomplished by drawing the liquid out through the bottom layer of mash solids, which acts as a filter. Hot water is added to the top of the mash tank to rinse the remaining liquid, now called wort, from the mash. The solid remains of the grain are dried and sold by the brewery as animal feed. The wort travels on to the brew kettles, where it is boiled to sterilize it, and where the carefully prepared hops are added. The addition of the hops is important because they contribute to the bitterness of the beer. The brew kettles are the most impressive equipment in the process. Gleaming copper, they can be 7-12 feet (2-3.6 m) in diameter and two stories high. Steam usually provides the heating energy to the brew kettles. After brewing is complete, the finished wort is filtered again and pumped to the fermentation tanks. Pilsner) are aged longer to increase the alcohol content. 5 After aging, the beer can be pasteurized to kill the remaining yeast and prevent further alcohol production. This is accomplished by heating the beer above 135°F (57°C). This process, named after Louis Pasteur, is widely known for preserving milk. 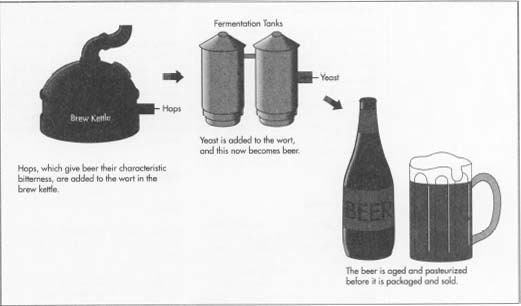 Interestingly, Pasteur originally developed this process to preserve beer in the 1860s. Pasteurization, however, is not used in the production of genuine draft beers. These beers are also known as "ice" beers, since they must be kept refrigerated to preserve their flavor and slow the remaining yeast activity. Many consider the draft beers best in aroma as well as taste. 6 Whether packaged into cans, bottles, or kegs, the beer is always moved gently through the maze of piping in the bottling area. This is to preserve the natural carbonation. During bottling, additional carbon dioxide gas from the fermentation kettles is used to improve the aroma of the beer. High-speed packaging lines can process thousands of cases of beer per day, and with modern computerized control, the inventory can be tracked throughout the distribution network. Most beer is delivered from local distributors who have purchasing contracts with the major breweries. Most beer is available in the following package sizes: "pony" cans and bottles of about 8 fluid ounces, standard 12-ounce cans and bottles, 16- and 32-ounce jumbo cans, 40-ounce "picnic" bottles, 8-gallon "pony" kegs, and the standard 16-gallon beer keg. Other novelty and party packages are also available. Cans and bottles are packed in 6, 8, 12, or 24 each to a box or case. Most states require a deposit at point of sale to encourage the return of the bottles and cans. When beer is dispensed from the keg, a pressure apparatus called a "tapper" is used to apply a light pressure of carbon dioxide (usually 2-6 PSI) to the tapper head for dispensing. Beer brewing produces several byproducts that can be used by other industries. During the malting of the barley, rootlets form on the grain and drip off. These can be collected and used for animal feed. The hops that is filtered out from the finished wort can also be collected and used again as fertilizer. The residual yeast from the brewing process is a rich source of B vitamins. It can be put to use by pharmaceutical companies to make vitamins or drugs, or used as a food additive. Used beer cans and beer bottles are routinely recycled. Recently, concern among citizens' groups over the excessive consumption of alcoholic beverages by some individuals has initiated additional government regulation of beer. New warnings have been added to labels, warning of impaired driving, hazards to pregnant women, and other health ailments associated with alcohol consumption. Reduced tolerance for drunk driving, for example, encouraged many brewing companies to advocate responsible consumption. As a result, certain states have established laws to control the alcoholic content of beer for sale within their jurisdiction. The beer industry will continue to contend with these large social issues. Much research is currently conducted in the area of plant engineering. Brewery researchers are manipulating the genes of barley and other common grains to increase their resistance to disease and to encourage helpful mutations. This genetic research also extends to improving the yeast. Current research is aimed at producing yeast strains that resist contamination and to making new varieties of yeast that can ferment carbohydrates, which common yeasts cannot process. The brewing industry is also making advances in the area of rapid testing for contaminants. New technology such as DNA probes and protein and chromosome finger-printing is being developed by brewers to detect microorganisms that can adversely affect the brewing process. Some of this technology is already in use in medical science for drug screening, AIDS testing, and pregnancy testing. Brewers are eager to adapt this cutting edge research to the beer industry. Briggs, D.E. and J.S. Hough. Malting and Brewing Science, vols. 1 & 2. Chapman and Hall, 1981. Hough, J.S. Biotechnology of Brewing. Cambridge University Press, 1985. Altany, David. "Seeds to Suds." Industry Week, May 4, 1992, p. 40+. Booth, Stephen A. "The Local Beer Returns." Popular Mechanics, November 1992, p. 44+. Hummel, George. "The Quest for Home-brew." Mother Earth News, December-January 1994, p. 54+. Polaneczky, Ronnie. "Beer Here! How Home Brewers Are Foamenting a Revolution." Philadelphia Magazine, December 1994, p. 57+.